This is Savvy with a twist! Two different parcels of Sauvignon Blanc from the same cool-climate Pemberton vineyard providing the perfect balance of flavours: half fermented in large oak puncheon oak barrels, the other half in stainless steel tanks. Voila... Fume Blanc! This delicate yet punchy white wine has heaps of limey, grassy, gooseberry overtones. Incredibly fruity and yet elegant with amazing texture, richness, length of flavour and just a subtle hint of oak. Drinking superbly now, but, will age well over the next 2-3 years. Serve chilled, but, not super-cold as you’ll mask the complex flavour characters. Absolutely delicious with fresh prawn and avocado salad with a tangy vinaigrette and crunchy sourdough bread! Prepare for the ultimate hot weather drinking buddy to meet your lips! Scrumptious passionfruit and tropical guava notes will sing out, leading to a luscious body and juicy lime finish. Conditions in 2018 provided a long slow ripening period to ensure fully flavoursome grapes before harvest. This naturally reduced the acidity in the grapes to soften the wine and make it more approachable than most Sauvignon Blancs on the market. Certified organic grapes form the crucial foundation for Tapi's everlasting popularity! Single vineyard to boot, this outstanding wine comes straight to your glass direct from the peerless Wairau River valley floor in Marlborough NZ, one of the best places in the world to grow Sauvignon Blanc. Mark and Gus are true believers in letting nature take her course to ensure the best wine is produced, especially when the fruit is this good! The vertically integrated Naked model means Mark, Gus and their team can bring you the best quality organic NZ Sauvignon Blanc for half of the normal price. All this wrapped up with a gorgeous new label for under $16 Angel dollaridoos - happy days! Mike's detailed blend of grapes from five sub regions is an essential part of maintaining the style and quality of his Lay of the Land Sauvignon Blanc. He's sourced fruit from the best growers to optimise its natural quality and craft wines with minimal intervention. The Rapaura grapes give structure and a herbal lift and the Lower Wairau grapes gift the palate with passionfruit and floral notes. The Waihopai Valley component adds citrus drive and weight to the mouth feel. This magical combination translates to a seriously approachable and balanced drop to please any white wine lover! 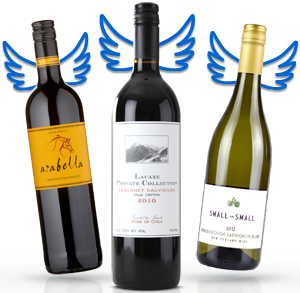 At under $11 for Angels, you will shock all your friends with this unbelievably tasty and pocket-friendly wine! The perfect wine to have stocked in the fridge for unexpected company. Randal Tomich bring’s Naked’s first ever Ice Wine. A phenomenal ‘sticky’, fresh and crisp with all the sweet flavours you’ll love! Frozen grapes are pressed to squeeze the most intense liquid from the grapes, creating a totally unique wine. From your first sip you’ll be hit with a luscious mouth-feel of marmalade, sweet nectar and butterscotch, with lingering fruit flavours combined with invigorating acidity and subtle spice. With only 200 in existence from the best vintage in 10 years in the Adelaide Hills, this wine is sure to fly. If you want to turbo-charge your next dessert this is the wine for you! Bill & Claudia have done it again, showing off all the wonderment the Marlborough has to offer. This wine combines grapes from two of the areas most renowned sub-regions, the Awatere and Wairau Valleys. Cool fermenting helped retain the hallmark vibrant aromas and flavours of Marlborough fruit. Citrus and melon aromas leap from the glass before the crisp and dry palate delights with lively fruit layers. This baby is utterly drinkable...sunshine in a bottle! 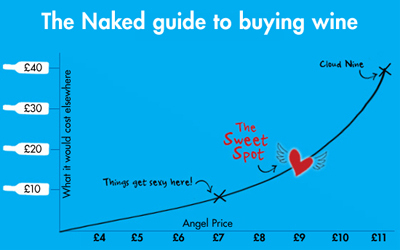 The last vintage scored a whopping 94% buy-again rating from thousands our beloved Angels, which is pretty tough to argue with! Of course, the fact that Angels can get this quality Marlborough drop at an unbelievably low price is another reason why it's hard to ignore. Don't fight it, go wild and lap up all the fun this wine has to offer. Liquid sunshine is here! This stunning treat from Stuart is perfect for warm, festive evenings. Lifted aromatics of guava and nectarines will greet you, while a creamy, nutty nuance accompanies the stunning citrus layers. The grapes for this wine were sourced from vineyards in the central and southern parts of Margaret River. Bright aromatics bring a delicacy to the wine that rounds off the signature magic of the SBS blend. All of the bright and zippy flavours continue to the very back of the palate. As soon as you open the bottle, you'll think of sunshine, white sand beaches, and turquoise blue ocean water...plus the price of a bottle is much less than the travel cost to get to Margaret River. Now that is stupendous value! This isn’t your average Sauvy. A delicious, textural white wine made in the style of a red. Grape juice left in contact with grape skins, pulling out flavour and tannin. Left cloudy intentionally for more flavour. Known around the traps as an “orange” wine, due to the colour. This wine brings a textural experience in both appearance and feel, with zippy acidity and a fruit flavour profile of grapefruit, lemon and pineapple that transcends robust depths and subtle heights. Ahhh, yum! Leighton makes wine on the edge, pushing the envelope and looking to make wines that challenge convention. Totally unique, for those interested in expanding their wine knowledge. Bright punchy guava aromatics with hints of nectarines and passionfruit will greet the lucky duck cracking this bottle open! The flavours have a subtle richness mirrored on the palate, that somehow fill the mouth without being heavy or cloying. It has wonderful fluidity, making the wine flavoursome yet still oh-so refreshing! This is Stuart’s fourth Sauvignon Blanc vintage for Naked, and it is more popular than ever, with every vintage over 90% buy-again rating! The conditions in the southern parts of Margaret, where these grapes are from, resulted in brighter aromatics and a truly delicate wine. Just imagine... you, a bottle of this, a warm spring day and a hankering to sit back and appreciate the finer things in life. It's rare to find a wine with such distinct varietal fruit characters, poise and harmony at this price point. Enjoy the Naked way! This is the triumphant return of Rory's amazing barrel fermented white! Yes that's right, all the glory of a crisp, citrus based Sauvignon Blanc palate with added texture and layers of subtle and oak, the kind usually only seen in Chardonnay. Rory has carefully blended fruit from Northern and Margaret River sites to craft the flavour spectrum just as he wanted it. He had the freedom to allow skin contact from certain parcels to extract max flavour. If you're looking for something a little different, or a reliable wine for the Sauv Blanc lover in your life, you've got to give this a whirl! Margaret River wine at this price is almost unheard of, so why not double up? Single vineyard lusciousness from the pristine Adelaide Hills. Cold nights and mild days extended the ripening period ensuring maximum quality. Each row harvested separately in the cool of early morning to maintain optimal fruit quality, aromas and ripeness. The grapes were crushed and pressed immediately to extract the purest flavours. Delicate, lifted aromas of passionfruit and lime waft from the glass. An intensely concentrated flavour of fresh citrus lime, subtle passionfruit with remarkable fruit purity. This classic savvy shows a delicate minerality with a crisp acidity and long finish.